The Xiaomi has introduced its new Xiaomi Mi Home Projector Lite (Youth Edition) in China. It can project from 40 to 200 inches in 1080p resolution, comes with intelligent voice control and also has HDR10 support. The LED has 30,000 hours of life, so if you use to for two hours every day, it will last for years. The Mi Home Projector Lite comes only in white color, is priced at 2,199 yuan (US$ 320 / Rs. 22,440 approx.) 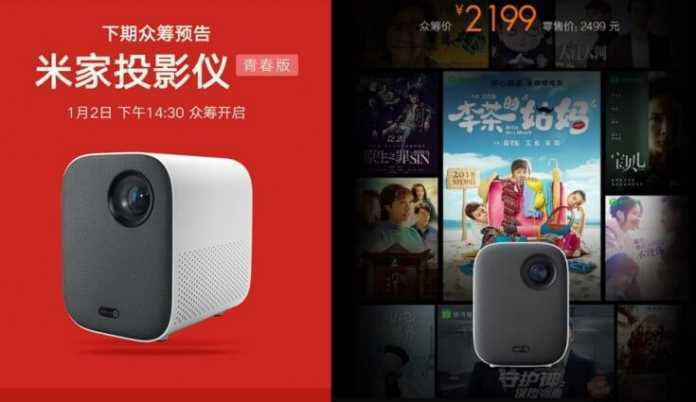 and Xiaomi Mi Home Projector Lite is available for order via its crowdfunding platform in China. It will retail for 2,499 yuan (US$ 364 / Rs. 25,500 approx.) after that. In a Weibo post, Xiaomi claims that the LED lamp on this Mi Home Projector can last up to 30,000 hours. It also has integrated speakers with support for Dolby Atmos as well as DTS. The projector comes with ports for USB, HDMI, and an aux port at the back which can be used to connect it to other peripherals.